Researchers have discovered that a bacterium found in camel crickets is capable of breaking down lignin—the stuff that makes wood tough—opening new research pathways for the development of biofuels and chemical manufacturing. The study also highlights the potential inherent in using ecosystem analysis as a tool for targeting research into the identification of commercially valuable microorganisms with industrial applications. "One of the things that this work tells us is that there appears to be real value in using what we know about ecology, and the behavior of organisms in their environment, to target research efforts aimed at identifying useful microbial species," says Stephanie Mathews, first author of a paper on the work and an assistant professor at Campbell University. "For example, as we learned, if you are looking for microorganisms that can help break down lignocellulose, it makes sense to look at the microbial species found in animals that are able to eat plant matter that contains large quantities of lignocellulose," says Mathews, who began work on the study while a postdoctoral researcher at North Carolina State University. The research stemmed from a 2014 citizen science study involving camel crickets, in which study participants asked researchers what value camel crickets might have. "We knew that camel crickets can eat almost anything, so we began to wonder what bacteria might be in a camel cricket's microbial ecosystem that allows them to do that," says Rob Dunn, a professor of applied ecology at NC State and corresponding author of the paper. 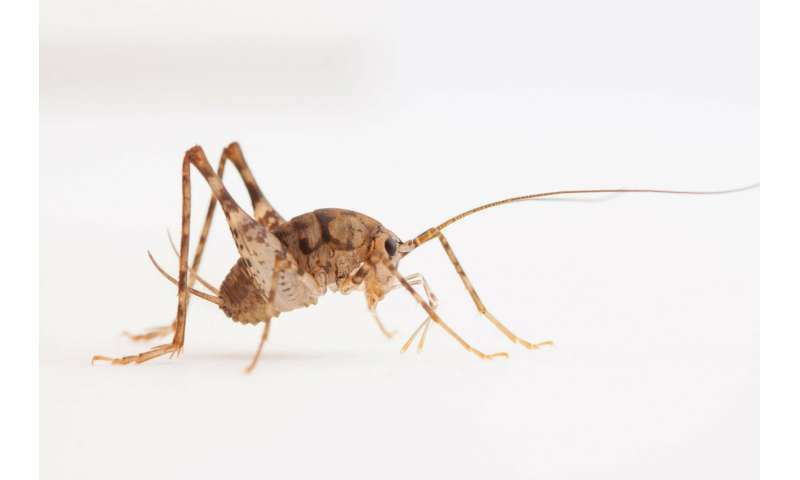 "We identified and tested a range of microbial organisms associated with camel crickets, but ultimately identified a strain of bacteria called Cedecea lapagei as being particularly interesting," Mathews says. C. lapagei was already known to science, but had not been well studied. The researchers found that it is capable of breaking down lignin—the chemical polymers found in plant cells that are responsible for making wood tough. "Lignin is notoriously difficult to break down, and biofuels researchers are interested in finding new tools that can be used to break it down in order to make the sugar molecules in plant matter available for use in biofuels manufacturing processes," Mathews says. "C. lapagei may be a valuable new resource for those researchers, since it's capable of surviving in a wide array of conditions, meaning that it might be useful in an array of industrial settings. "This discovery may also facilitate research into using lignocellulose, or wood, as feedstock for making chemical products that are currently made using petroleum." However, the researchers note that the real value of this study may be how it informs the future hunt for commercially valuable microorganisms. "This project highlights the value of workflow that begins with studying an ecosystem, proceeds to evaluate the role of organisms in that ecosystem, and then becomes increasingly specific, down to the level of each organism's microbiome," Mathews says. "At each step, you are collecting information that allows you make increasingly informed decisions about where to look for microbial resources that may have practical applications." The paper, "Public questions spur the discovery of new bacterial species associated with lignin bioconversion of industrial waste," is published in the journal Royal Society Open Science. The paper was co-authored by Mary Jane Epps of Mary Baldwin University; Kevin Blackburn, a laboratory manager at NC State; Michael Goshe, an associate professor of molecular and structural biochemistry at NC State; and Amy Grunden, a professor of microbiology at NC State.